District 8-AA Player of the Year Justin Davenport, 3, drives past Livingston Academy's Brock McCoin during the Region 4-AA Championship Thursday. Davenport scored a game-high 26 points and earned All-Region Tournament honors. (CANDICE JONES photo). SPARTA - The road to the TSSAA Class AA Boys State Tournament became tougher for Cannon County but the journey remains alive. Livingston Academy continued its nearly decade-long dominance of Cannon County with a 70-61 victory in the Region 4-AA championship game at White County High School Thursday night. The Wildcats beat Cannon County for the fourth time this season and the 17th consecutive time dating back to 2004. The loss sends Cannon County (22-13) on the road to Region 3-AA champion Chattanooga Howard (22-6) for Monday's TSSAA Class AA Boys Sectional. Tipoff is 6 p.m. (Central). Livingston Academy will play host to Chattanooga Tyner. "It's tough right now because the guys played their hearts out and put a lot into this game, but we are still playing," third-year Cannon County Head Coach Matt Rigsby said. "Our team will come back strong. They are a resilient bunch and they have been playing solid basketball since Christmas. I expect that to continue Monday." Three Lions - Justin Davenport, Jared Nave and Cody Ruehlen - were named to the All-Region 4-AA Tournament team after helping lead Cannon County to its first Sectional (or Substate) appearance since 2000 when the top three teams advanced from the region. The last time a Cannon County team reached this point with only two teams advancing from the region was 1985, which also is the last time the Lions reached the TSSAA Class AA State Tournament. Davenport led the Lions with another sterling effort. The District 8-AA Player of the Year poured in a game-high 26 points and dished out four assists. He scored 25 or more in all three region tournament games and has reached double figures in 41 consecutive games. Davenport has scored 25 or more 12 times this season. Ruehlen added 13 points and seven rebounds, Colin Jones netted eight, Nave seven and T.J. Mitchell five for the Lions. Tournament MVP Mason Ramsey led Livingston Academy (22-11) with 25 points and powered the Wildcats' victory. "This loss hurts but we have another game," Davenport said. "All that matters now is we are still playing and we have to put this behind us. We battled and had our chances but we just weren't able to finish it so we have to take care of business on the road." Cannon County trailed by as many as 14 in the second quarter but battled back and made a strong run at what would have been its first region title in 26 years. It was a one-possession game for most of the fourth quarter. Jones' second 3-pointer tied the game 51-51 with 3:56 remaining to ignite the strong Lions' crowd. Livingston Academy pushed the lead back to three, 54-51, with 3:11 remaining but Davenport answered with a gut-check trey to even the score 54-54 with 3:02 remaining. "Justin had a really good game and he was able to get in a nice rhythm that forced them to double him and create some open shots for other players," Rigsby said. "We knocked down those opportunities and it gave us a good chance to win this game, but we couldn't get some key stops down the stretch when we needed them." 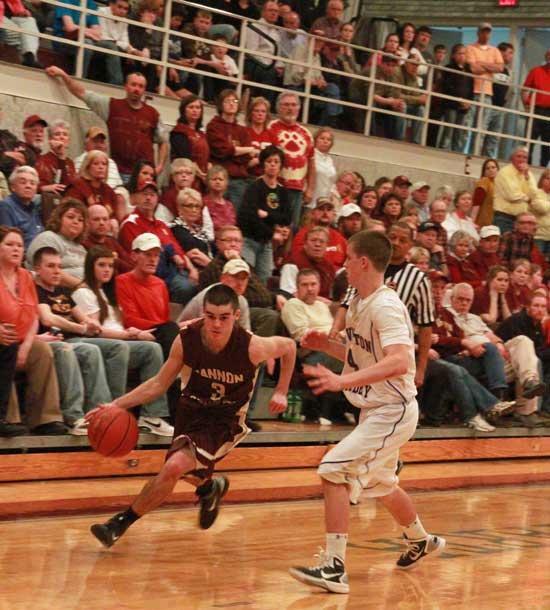 One example was the Livingston Academy possession following Davenport's game-tying 3-pointer. Cannon County played excellent halfcourt defense and almost forced a turnover but Ramsey found teammate Jake Huitt on the wing, whose 3-pointer proved gut-wrenching and provided the Wildcats a 57-54 lead. Ruehlen's offensive rebound and putback on the other end pulled the Lions to within 57-56 with 2:28 remaining, but the Wildcats went on an 8-0 run over the next 61 seconds to pull away down the stretch. "It's tough when you play so hard and then don't get the result, but we have to keep going," Jones said. "Late in the game they started getting more physical with us and we didn't answer. That was the difference." Livingston Academy was on the verge of breaking the game open when it built a 28-14 lead on Huitt's 3-pointer with 4:23 remaining in the first half, but the Lions buckled down and went on a 13-2 run to pull to within 30-27 at halftime. Davenport scored nine of the 13. The momentum carried into the third quarter. Davenport and Nave combined for 12 points to start the quarter and Cannon County connected on its first six shots. The Lions capped a 15-6 run to start the quarter with Ruehlen's 3-pointer to take a 42-36 lead with 3:54 remaining in the frame. It was - and would prove to be - Cannon County's largest lead of the game. The Lions fizzled after building the six-point lead, going 1-of-5 from the field with two costly turnovers to end the half down 47-44. "Our best game is penetrate and kick and that was working," Davenport said. "We were able to get in rhythm and get some good looks but they took that away from us at the end of the game and we couldn't hit shots." The free-throw line also was a factor. The physical Livingston Academy squad found its way to the free-throw line 23 times. Cannon County shot just two free throws - a pair of Mitchell attempts with less than a minute remaining. Cannon County never reached the bonus in the game. If I'm not mistaken the boys finished 3rd in the district tournament and 2nd in the region tournament. Does this mean that they will finish 1st in the state? I hope so!!!!!!!!! !